ALBERTON – Details of how Relebohile Koaeana ended up shackled and locked up in a garage for three days without food by her bosses in a foreign land are nothing short of shock. The domestic worker from Maseru was being forced by her employers in Brackenhurst, Alberton South Africa, to admit she stole R800 000 and reveal the money’s whereabouts in August 2015. Following souring relations with her bosses, the then 33-year old Koaeana had decided to unceremoniously leave her job and came back to Lesotho on June 21 the same year, but this did not sit well with the Tshabalalas who came hunting for her in Maseru, hardly two months later. Koaeana’s bosses, Vusumuzi Jethro Tshabalala (43) and his wife ’Mapula Patience Ramatladi-Tshabalala (41), were accompanied by two others to cross over to Lesotho and reported at the Pitso Ground police station in Maseru, about the alleged theft of R800 000 and that their domestic helper was a fleeting suspect. How the couple purportedly kept almost one million Rand in their house for the domestic worker to have stolen it, remains a mind-boggling question even for the police. On August 1 2015, Koaeana was arrested at the Maseru Mall by a member of the Lesotho Mounted Police Service (LMPS) and later allegedly handed over to the Tshabalala family handcuffed, without any paperwork. Koaeana said she had denied knowledge of the money when Matela handcuffed her. Together with the Tshabalalas, she was then ferried to her relative in Ha-Thetsane. “I should mention that I was not even asked to provide directions to my relative’s place. It appeared the police already knew the place, to my surprise,” Koaeana said. “Then Tshabalala’s wife and their accompanying gentlemen entered the family compound and retrieved my kit containing my items. The place was then ransacked with the police demanding that me and my relative should produce Tshabalala’s money,” she said. The money was not found and Koaeana was taken back to the Pitso Ground police. “At Pitso Ground, the police began to assault me with fists and kicks, demanding that I should produce the money I had stolen from Tshabalala, and when I persistently denied any knowledge of the money, Matela informed me that I was going to produce the money as I was going to South Africa with the Tshabalalas,” she said. When she was handed over to the Tshabalalas, Koaeana said she did not witness any paperwork authorising the process by the police. “No form of any document was presented and or explained to me and I was made to leave with Tshabalala, his wife and their accompanying gentlemen. I should point out also that no passport was required and or produced by or for me at the border. Everything seemed to have already been prearranged, surprisingly,” she said. What Koaeana suffered between the Pitso Ground police station and Alberton was anything between being kicked, slapped and struck with a wheel-spanner by her bosses – now her capturers. She narrated how the Tshabalalas had stopped their vehicle somewhere near Ladybrand and viciously assaulted her. “They stopped the vehicle along the way and in the presence of his wife and the gentleman, Vusi reigned serious and vicious assault on me with his fists. I could do nothing but scream. I called for help but there was no one in sight as it was already beginning to be dark. The wife and their friend kept asking me to produce the money to safe myself,” she said. All this time Koaeana was handcuffed, she noted. The team drove to Alberton where the worst awaited Koaeana. She was immediately locked up in the family garage still shackled. “Three days I was locked up in the garage without food but only water, and in between Vusi would return from work in the afternoon to commence his most vicious assaults on me,” she said. But what seemed like slow death of the worst kind for Koaeana ended at evening of the third day when, and she said this was through the grace of God, she managed to break free using a screwdriver. “I had noticed, when the family’s new domestic helper had brought me water to drink, that there was a toolbox. After the helper had left back to the house, I gathered whatever strength I had left and struggled opening it. I was able grip a screwdriver from insight the toolbox. I used the screwdriver both to free my hands from the cuffs and open the garage door,” she said. Koaeana found her way out of the Tshabalala premises through climbing over a brick wall fencing the yard unnoticed. She ran for dear life along the R59 Road from Alberton in the direction of Vereeniging. Throughout that night, Koaeana had hitchhiked all way through the towns and said she could not thank enough good Samaritans who offered her lifts until final destination in Lesotho. When she got back to Lesotho, Koaeana still had the cuffs hanging one hand. “I had only managed to open the cuffs on one hand with the screwdriver. Even the person who first gave me the lift between Alberton and Kroonstad could not open the cuffs from the remaining hand as he tried,” she said. 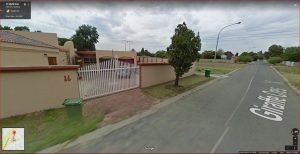 The MNNCIJ crew in July 2018 visited the Tshabalala’s residence in Alberton only to find that the family had relocated. The house had been sold to a new family. The Centre’s investigations revealed ’Mapula worked for the South African Revenue Authority (SARS) as an administration officer. Her husband, Vusumuzi (Vusi), was an executive at the City of Johannesburg Metropolitan Municipality. Having found contacts of the Tshabalalas, the Centre specifically asked ’Mapula how Koaeana had allegedly stolen the money and where was such a large sum of cash kept. “I hate the mention of her name. I don’t want to talk about her. I don’t want to hear anything about her,” ’Mapula said, furiously. Ironically, Koaeana told the Centre she was not aware of any businesses Tshabalalas owned during her stay with the family in 2015. ’Mapula said they had first reported the theft with the South African police before coming to Lesotho. “Even as I make my enquiries about this girl (Koaeana), I heard even from her relatives that she was a profound thief. She left my six-year old child alone in the house. I don’t wanna talk about that lady, she is evil. It’s a chapter that we have closed. In life, we don’t look back, we are looking forward to the future…,” she said. According to ’Mapula, Koaeana was on the wanted list of criminal suspects by the Interpol in South Africa. “That person (Koaeana) is being wanted by the Interpol. If I come with the South African police and the Interpol officials to Lesotho you should show us where she is. I want justice because I know she chowed the money. It is gone. I’m emotional because she ate the money and she has since excreted it at toilets. I just want her to be arrested now,” she said. ’Mapula refused to take further questions but insisted that the Centre should call again at 4:00pm and talk to the family’s lawyer. “You know what, call later at 4:00pm and talk to my husband, he will lead you to our attorney, who will take further questions,” she said. When the Centre called back ’Mapula at 4:01pm, the phone was answered by Vusumuzi, who sounded a bit hostile. Vusumuzi was quick to say that he was not interested in the story but how the Centre was going to help him find Koaeana. “I’m not interested talking to journalists. Police, this side, are looking for this individual. How are you gonna help us find this person?” he said. Koaeana’s ordeal is also contained in the High Court files where she was represented by Advocate Mahase. But Mahase had dropped the case over issues he said were personal. “I still want to go back to Ms Koaeana and resume that case. It doesn’t sit well with me that I couldn’t pursue it to finality because of personal problems. Ms Koaeana’s story is simply pathetic. Something has to be done about it,” said Adv Mahase. He noted he had even secured a court order interdicting the police from “harassing” Koaeana. Senior Inspector Beleme Moerane, of the Lesotho Mounted Police Service’s Child and Gender Protection Unit (CGPU), has confirmed Koaeana’s case had come to their attention. Ironically, the R800 000 purported by the Tshabalalas to have been stolen by Koaeana, has been recorded by the police as M250 000, R550 000 short of what the family claims to have reported at Pitso Ground police station. S/Insp Moerane said the M250 000 was exactly the amount that was reported by the Tshabalalas back in 2015. But still Moerane noted whether the correct sum was R250 000 or R800 000 it was strongly suspicious of anyone to keep such large amounts of cash in their house. “We know about the case and we have been trying to pursue it, especially in terms of charging the police officer (Matela) implicated in the matter to have been the one who handed over the victim to the Tshabalalas. But the challenge here is that there is not enough evidence against the said officer implicated,” S/Insp Moerane said. “Also, what remains intriguing is how the Tshabalalas managed to keep such large sum of money in the house. There are such a lot of issues that should be properly investigated in this case. But all in all, our intention was to first clean up our own house by reprimanding the said police officer but with evidence,” Moerane said. In particular, Moerane said a person who was travelling with Koaeana at the time of her arrest at Maseru Mall was refusing to testify against Matela. Koaeana told the Centre her companion had told her he was fearful of Matela and, therefore, could not testify. Efforts to secure a comment from Matela by the Centre were unsuccessful. Meanwhile, the pair of handcuffs that fastened Koaeana are still kept by office of the Commissioner of Refugees, which coordinates issues of human trafficking, after she was assisted by relatives to remove them. Nthatisi Thabane, the human trafficking coordinator from the office, has confirmed knowledge of Koaeana’s case, saying they kept the cuffs for evidence. Koaeana’s case has also been reported before the Law Society of Lesotho, Women in Law of Southern Africa and the Legal Aid, among others, but action is yet to be instigated.